You may not have noticed, but on New Year’s Eve the Securities and Exchange Commission hit car rental giant Hertz ($HTZ) with a $16 million fine for sloppy accounting practices in the early 2010s, which ultimately led to a financial restatement in 2015 that shaved $235 million off Hertz’ pretax income. Ouch. The restatement spanned financial results from 2011 into 2014, and for a company with roughly $440 million in annual pretax income before the restatement, a $235 million hit to the bottom line hurts. Hertz had cooked the books in two ways. First, it extending the estimated lifespan of its vehicle fleet from 20 months to 24 or 30 months. That meant depreciation of the vehicles was allocated over more periods; those lower depreciation numbers cut operating costs, which in turn raised net income for any given period. Second, Hertz also kept its allowance for doubtful accounts artificially low after a crucial operations change in 2012. That summer, Hertz decided to turn over many more aging accounts to private attorneys for collections — but assumed, without any evidence, that the allowance for doubtful accounts could stay at around 15 percent of the total. In reality, those private attorneys couldn’t collect on 98 percent of the total. We recount all these details to show you that Hertz’s poor accounting practices spilled across numerous line items, for numerous years. 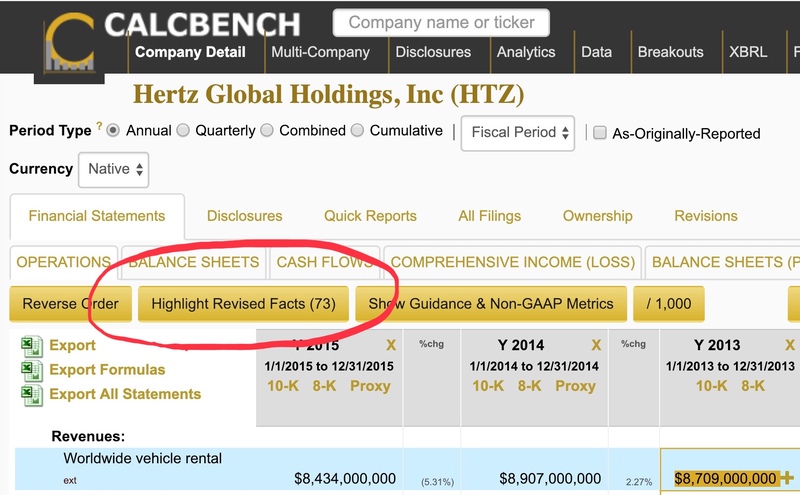 And yes, if you’re a curious financial analyst who follows Hertz — Calcbench can show you all those details. 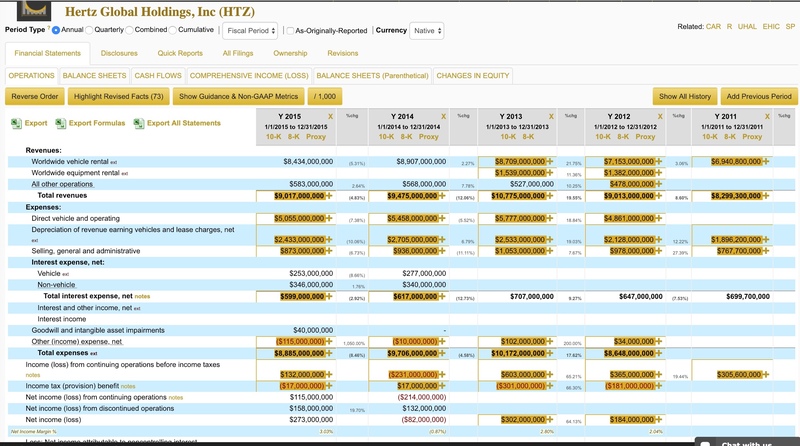 As we’ve written before, our Company-in-Detail page displays all a company’s financial details in line-item detail. But you can also use our Highlight Revised Facts feature to see which line items have been changed at some point in the past. See Figure 1, below. Many companies will revise some facts from time to time. Rarely do we see so many facts revised at once — which is a good thing, since financial restatements are decidedly bad things. Regardless, if you want to see which numbers a company has changed, to better understand how reliable the firm’s financial reporting may or may not be, Calcbench has you covered.